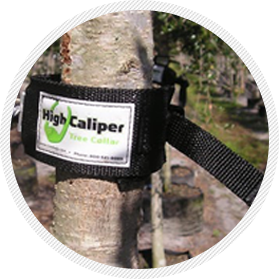 The patented Tree Collar is the premium device for securing trees and preventing wind blow over. Keeps your trees upright and uptight! 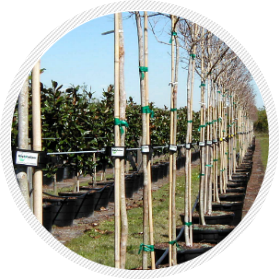 The Tree Collar fastens to a cable line to hold a row of plants in a production or retail setting. 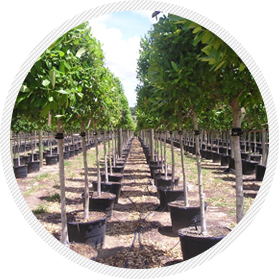 number of plants in a row or by retail garden centers that need a permanent holding area where larger container plants can be securely held and displayed. The Tree Collar works on a cable line. Most customers use a high tensile cable either 3/16” or ¼”. Do not use a plastic coated cable, as this may cause the Collars to slip. The cable is attached to posts in the ground. If the post is wood, be sure to use a treated wood. A 4” by 6” by 8’ wood post is common. Using an auger, sink the post 3’ in the ground. The posts may be placed as much as 50’ apart. The entire run might be over 400’ long, with a supporting post every 50’. If the plants are placed apart every 5’, a 400’ cable run might hold up to 70 trees. Many customers place a turnbuckle at the midpoint of the cable line. The turnbuckle is used to tighten and loosen the cable line as needed. Do not allow the cable line to pull against the posts and pull the posts out of the ground. Support the posts. A ground anchor, similar to an anchor for a mobile home, may help secure the cable line and the posts. 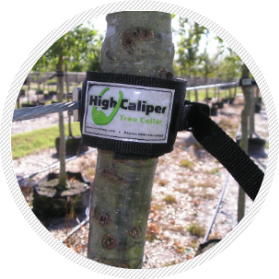 The High Caliper Tree Collars attach to a cable line by a galvanized steel plate. Screw the plates together to secure the Tree Collar. 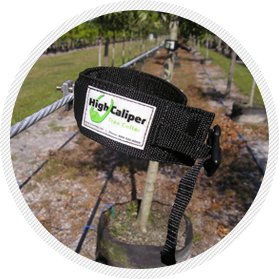 The Tree Collar will be locked into place, creating a permanent holding station for your trees. Secure the tree on the Tree Collar. 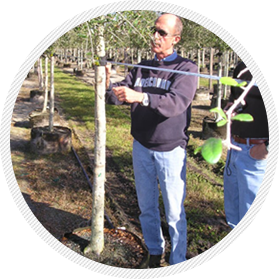 Make sure the plant sits flat on the ground and is not leaning into the cable line or the Tree Collar. Do not fit the Tree Collar too tight. Leave about a ¼” of space between the Tree Collar and the trunk. Resize the Tree Collar as the tree grows. 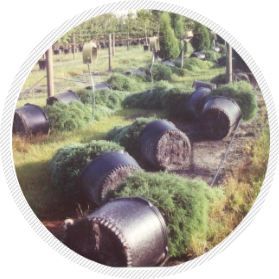 If the tree is held for one year, for example, you may need to enlarge the Tree Collar three or four times. Do not let the tree trunk grow into the Tree Collar. This will damage the plant. We look forward to helping you plan, set up, or modify your post and cable line system.